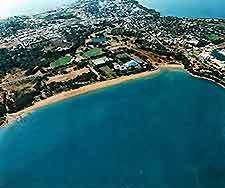 Darwin serves as the principal city within the Australian Northern Territory and is located at the end of a scenic peninsula, where it is surrounded by Darwin Bay, Fannie Bay and Frances Bay, once the lands of the Larrakeyah Aborigines. With a diverse landscape filled with tropical vegetation, the city boasts plenty of tourist magnets, while further afield, attractions come in the form of the Bathhurst and Melville islands, Kakadu, Litchfield Park and numerous bushlands, all of which are within easy reach. The city has a number of cafés and outlets where you are able to use the Internet and also send emails. 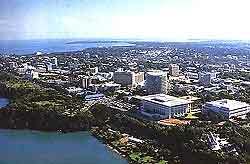 Internet access is available in most hotels, in hostels, at Darwin Airport and throughout the city. There are several tourism offices and visitor centres sited throughout the city, with the Darwin Regional Tourism Association Information Centre being a good port of call for tourists arriving here. English is the main language in Australia. Although 'Aussie' accents can be strong, with distinct phrases and local terminology, local accents are generally very easy to understand. All visitors to the Northern Territory and all parts of Australia require a visa, except for visitors arriving from New Zealand. Application forms for visas can be obtained from either Australian diplomatic missions overseas or travel agents. 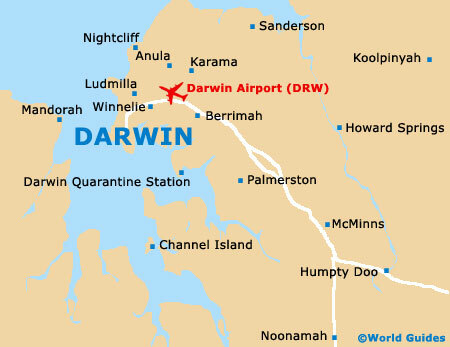 Strict rules issued by the Department of Immigration and Multicultural Affairs (DIMA) allow overseas visitors to work in the Darwin area. Visitors to the Northern Territory of Australia aged between 18 and 30 from countries abroad, such as the United Kingdom, the Republic of Ireland, Canada, South Korea, Germany, the Netherlands, Japan and Malta, may apply for a Working Holiday Visa, which can last up to 12 months. The majority of services in Darwin do not usually receive tips, with the exception of porters, waiters and taxi drivers. Also restaurants in the Northern Territory expect a tip of approximately 10% of the overall bill, rounded to the nearest Australian dollar, unless the service or food was poor. Smoking in Darwin is now restricted in public buildings, restaurants and also on public transportation throughout the Northern Territory. When in Australia, it is sensible to avoid smoking unless others nearby are smoking as well.